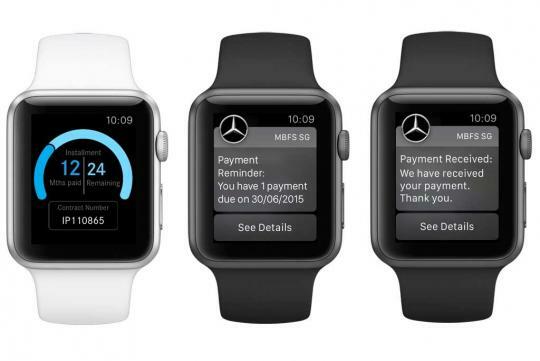 Mercedes-Benz Financial Services (MBFS) Singapore continues its digital push of applications and has successfully launched the new myMBFS app for the Apple Watch. This latest addition to Daimler Financial Services’ suite of digital applications is part of a series of on-going initiatives aimed at enhancing the customer experience for Mercedes-Benz customers. The MBFS customer online portal myMBFS.com.sg, was initially launched in April 2013 and was designed specifically for the needs of MBFS customers. The portal allows existing customers who finance their vehicle with MBFS to access their vehicle’s account information via the web-portal or the myMBFS app. Nearly one in three customers are currently active users of this account management tool. With the latest release of the myMBFS for Apple Watch, customers are now able to receive up-to-date information on their finance contracts at a simple glance of the wrist. Information such as the number of remaining payments for an instalment plan and the next payment due date are presented in an intuitive infographic on the watch face. In addition, customers can choose to be notified via the Apple Watch whenever a payment is due or successfully completed. “The addition of the Apple Watch app is a reflection of our commitment to enhancing our customers’ experience with the use of the latest in mobile technology,” commented Mr. Andreas Hinrichs, Director – Regional Management at Daimler Financial Services Africa & Asia Pacific (DFS AAP). The myMBFS app was developed locally by DFS AAP in partnership with Singaporean app developer, Appvantage Pte Ltd. The app is currently available for free on the iTunes AppStore.